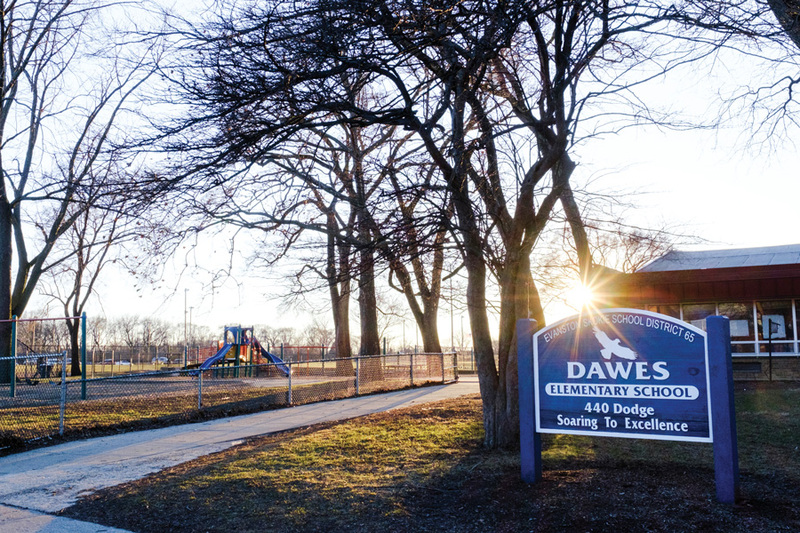 Dawes Elementary School, 440 Dodge Ave. Dawes parents voiced their concern about five principals in five years at the school at a school board meeting Monday. On track to have five principals in five years, parents, teachers and students at Dawes Elementary School are at “a tipping point,” said Laurie Haverkamp, who has a students in the second grade and kindergarten at the school. About 25 parents attended the Evanston/Skokie School District 65 board meeting on Monday, calling for consistent leadership at the elementary school and asking for an additional social worker, more teacher’s assistants, an assistant principal and more staff with crisis prevention and de-escalation training. On Wednesday, District 65 will hold a principal forum for a new leader at Dawes Elementary School. Haverkamp, the co-president of the Parent Teacher Association at Dawes, presented a statement to board members with the other co-president, Shannon Lang. Haverkamp said an influx of students with behavioral challenges has placed extra responsibilities on teachers, cutting into instructional time, threatening safety and creating distractions in school without the structural support of a steady administration. In the 2017-18 school year, over 30 percent of students at Dawes were English Language Learners and more than half received free or reduced lunch. The school also has a Two-Way Immersion Program where students receive instruction in both English and Spanish and multiple classrooms serving students in special education. Haverkamp highlighted the efforts of Juliana Perisin, the interim principal at Dawes, “doing all that she can” to advocate for parents and students. She emphasized the need for consistent leadership as they enter a new phase of the hiring process. Lang has been a parent at Dawes for ten years with a third grader at Dawes and a seventh grader at Chute Middle School. She outlined some of the qualities parents are looking for in a new principal, from bilingual skills to community-building skills. “The overarching theme is that Dawes keeps receiving more and more students with extreme social and emotional trauma without the support in place to take care of such students,” Lang said. Superintendent Paul Goren said the district has identified four candidates who will be interviewed at the forum Wednesday. The principal forum is a two-part process, starting with a panel of teachers, parents and the union presidents, Goren said, after which parents then have a chance to write down questions for candidates at a public forum on the same day. Goren said he takes feedback from the community and makes the final decision as superintendent. Goren said in an interview after the board meeting that the process started when a principal who had served at Dawes for ten years left and was replaced by an interim principal. The school brought on LaTarsha Green to serve as the long-term leader at Dawes, but Goren said he selected her to be the executive director of black student success, putting Dawes back in the hiring process. Goren said the turnout for the school board meeting demonstrated an engaged and caring community seeking the best for students. Lang said in an interview that she hopes this principal forum will be different from those in the past.